Tuesday nights is Speed Training night. Some folks call it “Speed Workout” or Speed Practice” (MRTC calls it “Track House Workout”). I call it Speed Training because that’s what Bobby calls it – you’ll have to ask him where he heard the name from! It is every 6:00pm at the University of Memphis “Old Field House Track”. If you are like me and didn’t go to U of M you would have absolutely no clue where that is (I don’t even know where the “New Field House Track” is, if it exists). Here is a map. Paul Sax runs it and keeps it interesting. No Tuesday night is ever the same. 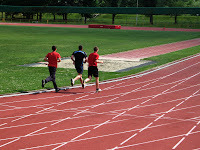 Generally, it is short, fast laps around the track and then rest for a little bit. One thing to remember that I didn’t know offhand is that 1 lap = 1/4 of a mile – use that to help you pace. I am definitely a slowbutt at these things, so don’t feel bad if you are too.